Because rain fell every single day of winter, this spring has the most wildflowers I’ve even seen. 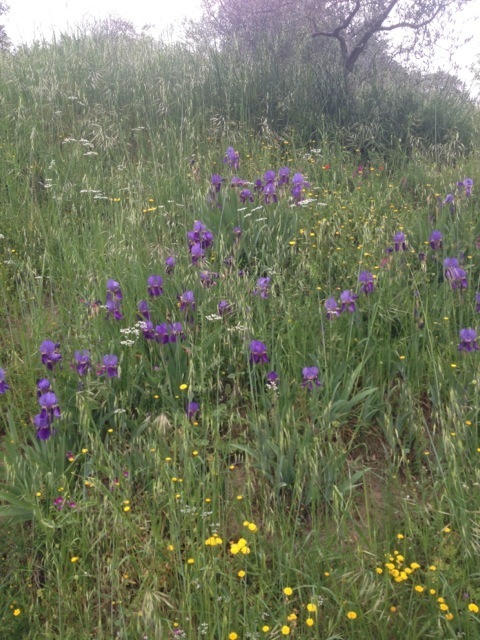 We’ve always had wild irises but this year we seem to have many more than usual. The hillsides are alight with that incandescent green, and wild lilac perfumes the air. 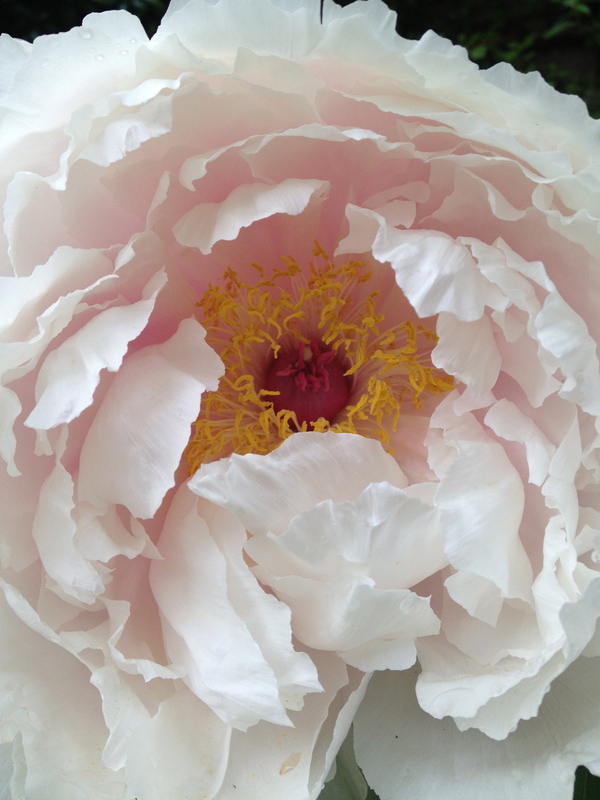 The most startling joy in the garden is the pink peony bush with face-sized blossoms. Lucky bees that get to roll around inside! April and May are tricky months in Tuscany. We’ve had our share of rainy rain days interspersed with brilliant and warm days with lunch outside and long walks on Roman roads. (I found the App called Moves and now know how far I go in a day.) Ed has been on his road bike rain or shine, and is loving bicycling here where the hills are formidable. Worth the effort, he says, because of the splendidviews, no traffic, and no charging dogs. Although my whole family has taken to cycling, I’m not there yet, so will stick to listening to Jane Austen and clambering along wild boar paths and backroads into town. I’m a late convert to audio books, but now that I’m on a three-mile-a-day regime, I am loving them. Formerly, I read while walking, but I got kind of seasick sometimes, and looking down kept me from enjoying the walk. May I recommend Nicole Kidman reading To the Lighthouse by Virginia Woolf? Her voice is subtle–I hate it when the reader is overly dramatic–and causes you to pick up nuances that you might even miss reading the book. This has been a fabulous experience, and has sent me back to the book. Next, I’m listening to Mrs. Dalloway. On my walks into town, I’ve concentrated on seeing what I’ve never seen before in Cortona. You’d think after so many years here I would have seen every stone. Not so. A town this old has so many layers and secrets nooks and twisty streets that I’m always discovering something new. Suddenly I notice a coat of arms or just a good door.Down a steep little vicolo (tiny street) I looked up and saw remnants of fresco on the vaulted covering. When I complained to Steven Rothfeld, our photographer friend about the swarms in Florence, he gave me good advice. “Look up!” And it’s true–so much to see above the crowds. 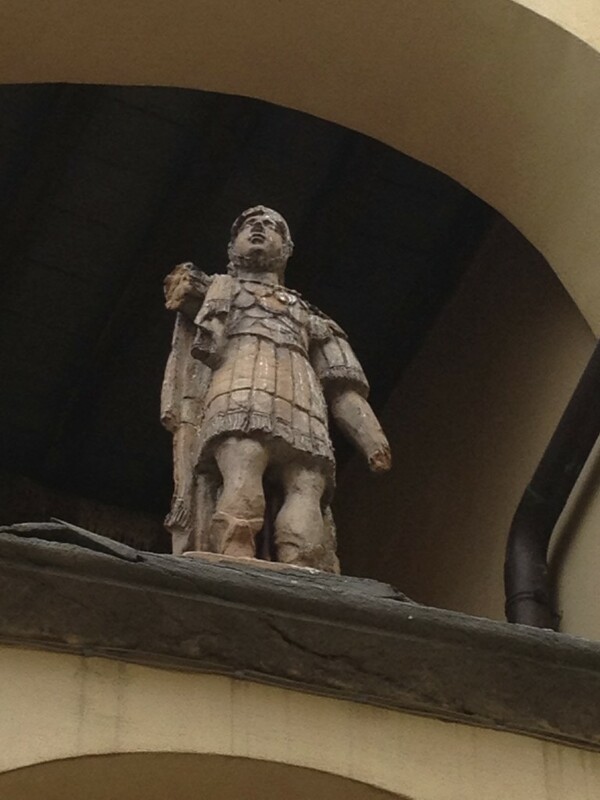 This morning in Cortona, I saw this figure, which looks Roman. There he stood, and in twenty-three years, we never met! 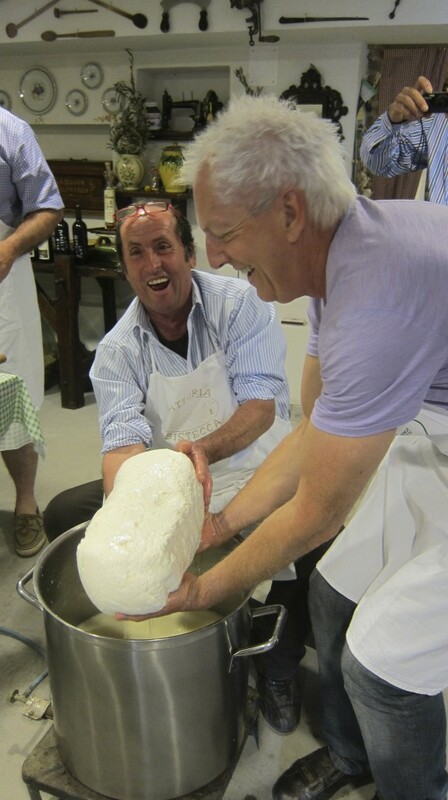 Another highlights: Friends from North Carolina came and we took them down to visit the Salvadore family where we made pecorino together. Lapo and Ed couldn’t be prouder if they’d delivered a bambino! The Salvadores have an agriturismo within walking distance of Cortona–a great place to stay because they are SO hospitable. 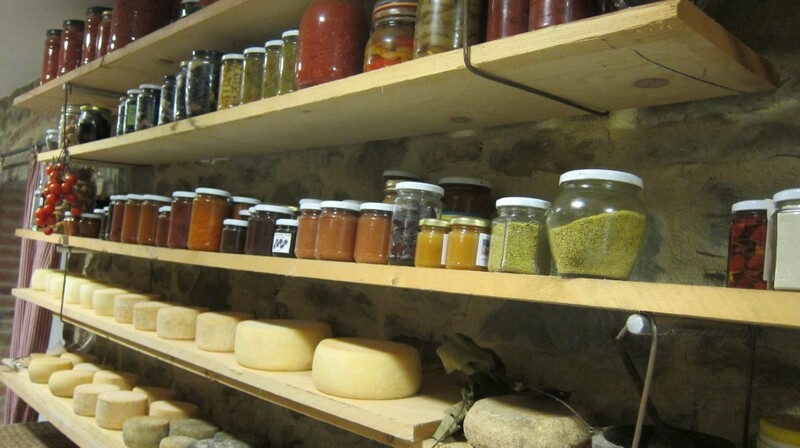 Here’s a glance into their pantry. You can see that they live close to the seasons. Those green jars on the end are fennel flowers, so bright on a pork roast or baked fennel. Another authentic agriturismo near our mountain house, is Il Poggio del Sole, owned by the Italiani family, who are featured in Our The Tuscan Sun Cookbook. Staying in your private cottage or apartment, but being able to get to know a terrific family is just a sublime way to travel. Both of these places know well the art of hospitality. Great cooks, all. But then there’s no reason not be to in Italy. 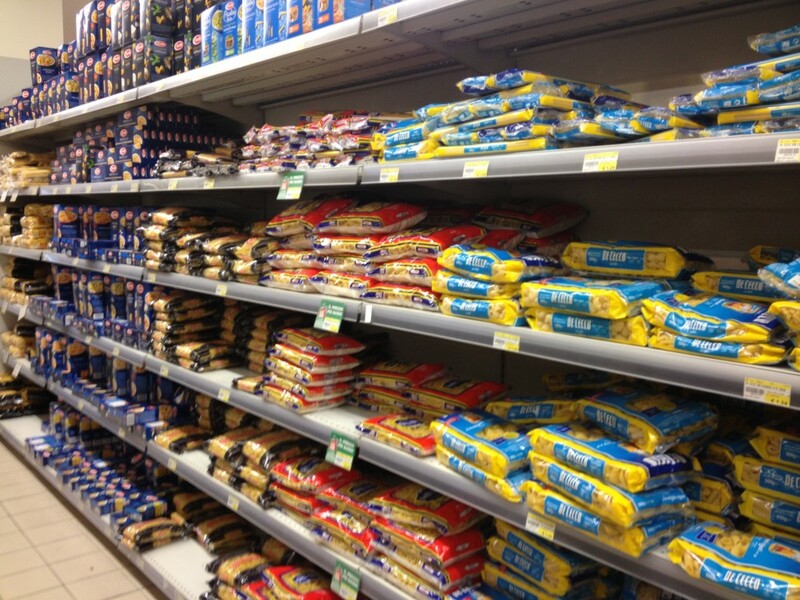 The shot below is just a portion of the pasta selection in a grocery store. And, there’s a fresh pasta shop in town, where one treat of spring is ravioli filled with young spring nettles. 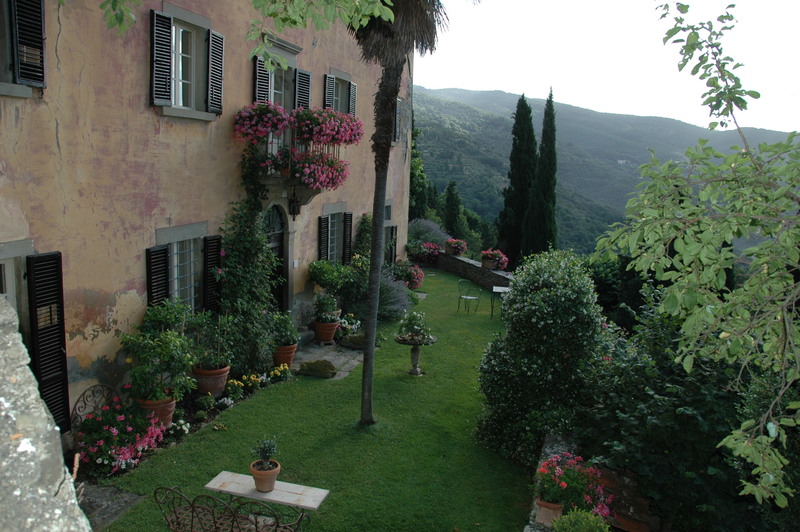 The lemon pots are out of the limonaia, the summer flowers are planted, and we are ready for that grand old Tuscan sun! As always, the great pleasure is simply being at home at Bramasole. Hope all of you are enjoying the trip closer to the sun, too, and have planted your tomatoes and sweet peas! Will post again soon. I’ve been revising a manuscript and feel that I’ve had on blinders for several months. Onward to summer!! !